One of the billboards for the new "Love it, don't trash it!" anti-litter campaign is located at S. Thornton Ave. and Cedar St. in Dalton. 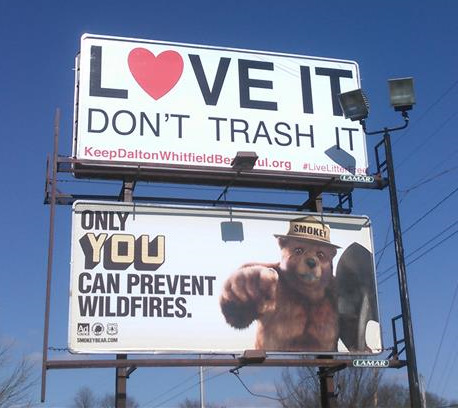 (Dalton, GA, February 10, 2016) – Keep Dalton-Whitfield Beautiful wants you to show some love to Whitfield County by preventing litter, trash in the wrong place, starting in your own neighborhood. 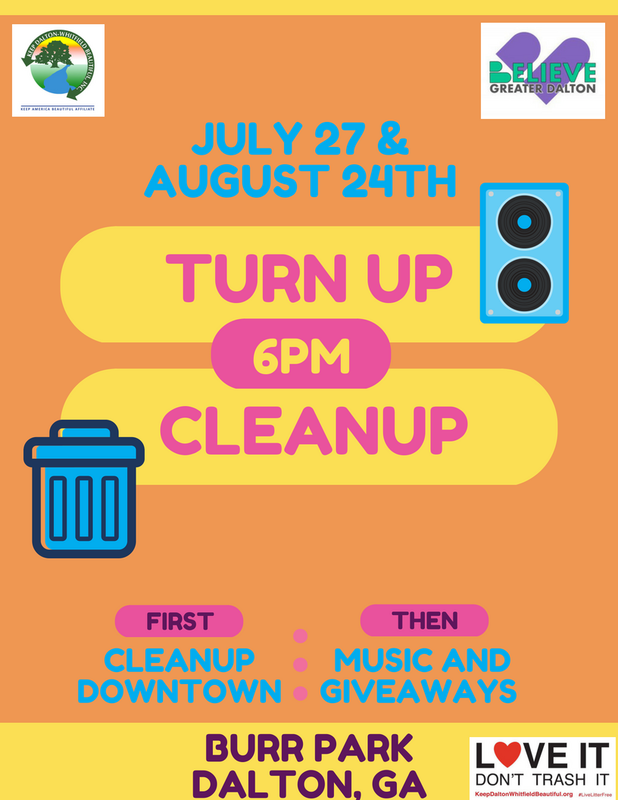 This month KDWB is launching a new educational campaign, titled “Love It, Don’t Trash It” aimed at providing residents with actions they can take to help prevent litter in our community. Residents can share how they’re showing our community some love on social media using the hashtag #LiveLitterFree. Litter is a growing issue in the Dalton and Whitfield community. Fast food wrappers, cigarette butts, and bottles along the road have become the norm. 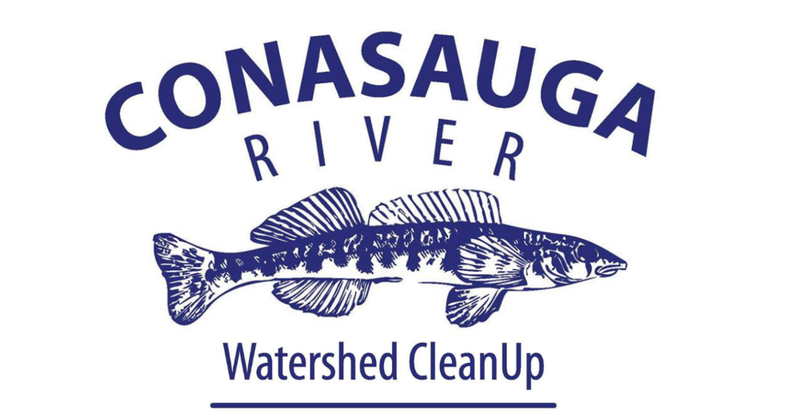 Litter impacts our quality of life, destroys our town’s natural beauty, can harm or kill wildlife, diminish water quality, and even contribute to motor vehicle accidents. Yet it’s important to recognize that litter is preventable when individuals take personal responsibility for their environment. Simple actions like keeping a plastic bag in your vehicle to collect trash, or properly closing the lid on trash carts can make a big difference. KDWB believes that the majority of residents in Whitfield County want a clean, beautiful, and vibrant place to live. Last June the litter prevention committee invited residents to submit their anti-litter slogan ideas to be used in the new educational campaign. In August the group chose the slogan, "Love it, don't trash it!" and the hashtag #LiveLitterFree out of more than fifty entries. Both phrases were slight variations on slogans submitted by local residents Eli Miranda and Robert Fernandez. Show Whitfield County some love - visit www.keepdaltonwhitfieldbeautiful.org, click on litter prevention, then download graphics with litter prevention tips to share on your social media sites. Use the hashtag #LiveLitterFree to see your post and what other residents are doing to prevent litter. Like the Keep Dalton-Whitfield Beautiful page on Facebook for weekly educational posts and updates on volunteer opportunities. Together we can make Whitfield County a more vibrant place to live. To help launch the campaign, there are two billboards posted with the campaign slogan along South Thornton Avenue and Cleveland Highway. KDWB also has bumper stickers, t-shirts, and other promotional items available for volunteers and residents. For more information about the campaign, contact Keep Dalton-Whitfield Beautiful at 706-278-5001 or e-mail Executive Director Liz Swafford at lswafford@dwswa.org.